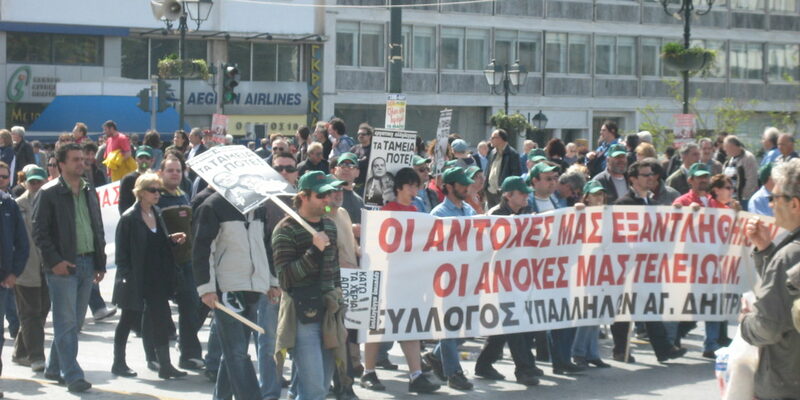 Strikes have always been a fact of life in Greece (along with lots of other countries in Europe, in fact last week we had guests delayed due to a strike in Spain, and we’ve personally been impacted while traveling through Germany because of a German airline strike!) but that isn’t reason to panic about your upcoming holiday in Athens. The city is chock full of places to explore and discover even when the buses or metro aren’t running, the archeological sites are closed and it seems you’ll have nothing to do. OK, I know, you came to see the Parthenon. Well no matter how hard they try, they can’t really close it off entirely because there are about a thousand great vantage points from which to admire it (see my note about hills, but even if you don’t want to climb a hill simply strolling down Areos Pagitou St, Apostou Pavlou St, the square in front of the old Olympic Stadium, many points in Plaka, Mets, and more). When in Athens, you will see the Parthenon. But you wanted to climb the Acropolis? Well how about making it as far as Mars Hill, where you can follow in the footsteps of Apostille Paul? Open 24 -7, it’s a great place for a Kodak moment. So don’t worry, you will be able to ascend the Acropolis roll. What about the rest of the historical sites? As you reach the Thisseio edge of the boardwalk, that beautiful temple you see perched amidst the green is the Temple of Hephaestus, also known as Thisseio, hence the area’s name. Kind of hard to hide that one. It is especially beautiful at night. Until just last year, the only way to see the Old Olympic Stadium was standing outside on the square. Hundred of thousands (more?) of tourists have admired this amazing beautiful marble stadium from front and center, and if they happen to be closed, you will be able to as well. Hadrian’s Arch, the Gate to the Old City of Athens, never closed, always viewable, and sneak behind it to admire the Temple of Olympian Zeus. Speaking of Hadrian, the best part of his library is viewable just off of Monasteraki Square, and further down the Ancient Keramikos Cemetary can be viewed from the scenic overlook built for that exact purpose! (As you walk toward Keramikos you will pass the Jewish Memorial, also open 24 hours a day). Tuesday to Sunday: 8.00 a.m. to 8.00 p.m.
Galleries cleared at 7.45 p.m. The Museum is open every Friday until 10 p.m.
Closed: 1 January, 25 March, Easter Sunday, 1 May, 25 December and 26 December. Reduced admission fee: 3 euros. Closed: on Mondays, New Year Day, on Good Friday, on Good Saturday, on Easter Sunday, May Day and on Christmas day. Closed on Monday and the following holidays: March 25th, May 1st, August 15th, October 28th, Christmas Day and Boxing Day, New Year’s Day, Epiphany, Easter Day, Easter Monday, Clean Monday, Holy Spirit Day. 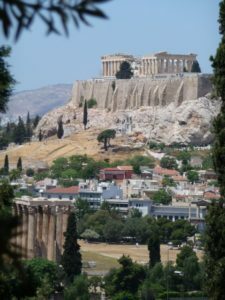 My 2nd most favorite Acropolis views are from this hill, where on Clean Monday (the first day of Greek Orthodox Lent) the hill is packed with locals picnicing and flying kites!) Oh, my first most favorite view? From our Acropolis View Penthouse Apartments of course! Rising up out of Kalimarmaro Stadio, this hill doesn’t usually make the guidebooks. It’s a bit of a “local secret”, although it’s hard to hide a hill! You’ll need to walk around behind the Old Olympic Stadium and follow Archimidous street until you reach the athletic club’s jogging path (entrance on Archimidous street) and then cut into the park. Of course if the athletic club is closed, continue past their gate to the stairs that lead up from the street – watch for the fence on your right at the top … the entrance, well, it is kind of obvious. Once inside you’ll have rare tourist photos across the towering pines over the Temple of Olympian Zeus to the Parthenon as well as a nice overview of the National Gardens, the lovely Zappeion building and down into Kalimarmaro (Marble) Stadium. See the little blurb at the beginning of this post under the Acropolis information. Before or after exploring Ardittou Hill, head down Ardittou street (in front of the hill) to Anapafseos Street, make a left and if you are hungry hope that Colibri is open, if not there is a great Greek taverna next door, and then continue down “Eternal Rest” Street (Anapafseos) until it dead ends (no pun intended) at the cemetery. Solemn and beautiful, a green oasis filled with some of the most amazing funeral monuments I’ve ever seen, you could spend hours here exploring. Be sure to look for the beautiful sleeping girl sculpture by the Tinos born Greek artist Yannoulis Chalepas. 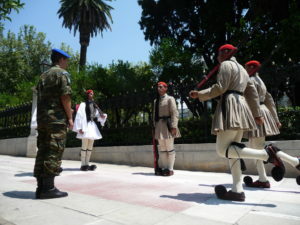 Through rain and heat, strikes and demonstrations, the brave, proud Greek Evzones have held their posts out front of the Greek Parliament Building as well as in front of the homes of the Greek President and Prime Minister. You can count on them performing their changing ceremony 24 hours a day, 7 days a week. If you happen to hit the area during a protest out from of the Parliament building on the Syntagma Square side and don’t feel like dealing with the crowds, you can watch them change on the backside of the National Gardens (I personally prefer this location, it is low key and somehow feels a bit more solemn watching them with a few passers by than with a gaggle of tourists who’ve just arrived from their cruise ships). You can also admire the beautiful Ernst Ziller designs which are now the homes of the President and Prime Minister, as well as a number of lovely sculptures around the Zappeion and National Gardens. NextWow, look at THAT building!